Civil law outreach to prisoners: what works? Online catalogue of plain language legal resources targeted at newly arrived migrants and refugees. The working group has mapped the provision of specialist free legal services across Australia. This table sets out information about the organisations providing specialist public legal assistance across states and territories in Australia. 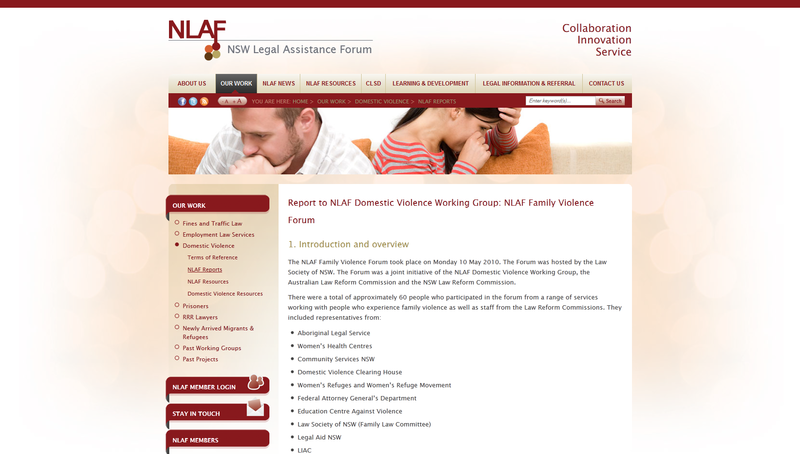 On 10 May 2010, the NLAF DV Working Group together with the Australian and NSW Law Reform Commissions hosted a Family Violence Forum. The Forum gave participants an opportunity to provide input into the Family Violence Inquiry. This document was produced to facilitate the making of submissions to the Inquiry. This document was produced to facilitate the making of submissions to the Australian Law Reform Commission Family Violence Inquiry.